The guns of pistol-packing gangster lovers Bonnie Parker and Clyde Barrow are heading for the auction block. The guns of Bonnie and Clyde -- the gangster love birds who were killed in a hail of gunfire nearly 80 years ago -- are hitting the auction block. 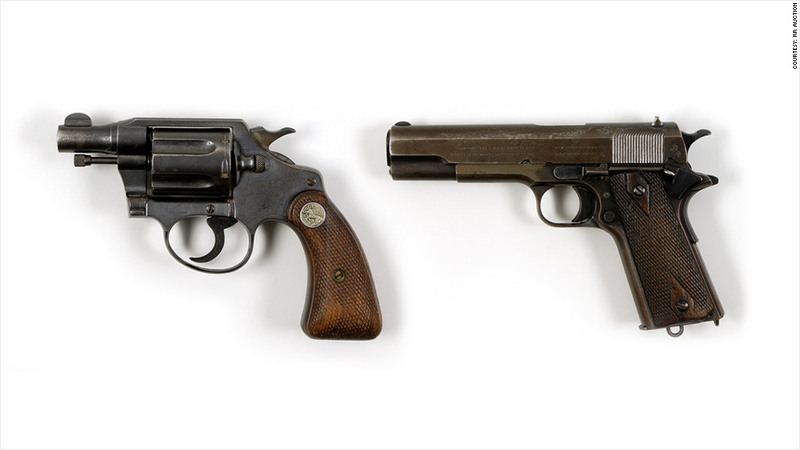 RR Auction is coordinating the auction of a snub-nosed .38 revolver that was found taped to Bonnie Parker's inner thigh and the Colt .45 semiautomatic pistol that was in Clyde Barrow's waistband after they were ambushed and fatally shot by a police posse in Louisiana in 1934. "These guns are well known in the marketplace, well known to Bonnie and Clyde collectors, well known to have belonged to Frank Hamer," said RR Auction vice president Bobby Livingston. Hamer was one of the officers who killed the gangster duo. The pistols are a small part of the arsenal that was found in Barrow and Parker's stolen car. Livingston said the posse officers were allowed to keep firearms and other possessions from the bullet-ridden vehicle, including the Colt that Barrow might have stolen from a federal armory in Texas. Livingston said the starting bids are $75,000 and his auction house is hoping to bring in $150,000 for each of the guns, which can be authenticated through a provenance paper trail. RR Auction is holding the sale Sunday in Nashua, N.H. and is putting other items from the car up for bid -- including blood-stained silk stockings, a makeup kit, a gold pocket watch and a silver dollar that was later owned by Mafia boss Paul Castellano. Livingston said Castellano considered it his lucky coin, but gave it away before the night in 1985 when he was shot dead in front of Sparks Steak House in New York. The auctioneer is keeping the sellers' names confidential. Parker and Barrow's death car items have fetched impressive bids in the past, including $85,000 for Barrow's bloodstained shirt. A submachine gun from one of their hideouts sold for $130,000 earlier this year, and a shotgun went for $80,000. Barrow and Parker were wanted for kidnapping, auto theft, robbery, burglary and 13 murders nationwide, including the killings of two police officers, according to the Federal Bureau of Investigation. The FBI was a fledgling agency at the time of the couple's nationwide crime spree, and tracked them down through its sole area of jurisdiction: interstate auto theft.